The New Zealand government insisted yesterday that the country's dairy products are safe, after traces of a toxic chemical were found in milk. Concerns were raised after dicyandiamide (DCD) was detected in New Zealand milk. Farmers applied the chemical to pastures to stop nitrate fertilizer by-products from getting into rivers and lakes. High doses are reported to be toxic to humans. China's General Administration of Quality Supervision, Inspection and Quarantine said they are asking New Zealand authorities to provide detailed information on the incident, after Chinese consumers raised concerns. This includes the quantity of DCD discovered and the brands and batches involved, China's Central Television reported yesterday. However, there were no reports of New Zealand dairy products being taken off the shelves in Chinese shops. About 80 percent of China's imported milk comes from New Zealand, according to Xinhua News Agency. The scare began on Thursday, when two major New Zealand makers of agricultural chemicals announced that they had suspended sales of DCD after low levels of the substance were found in dairy products. New Zealand Ministry for Primary Industries, Director-General Wayne McNee said yesterday there has been some confusion about the suspension of DCD. "The use of DCD was suspended by its manufacturers because very small traces of residue were unexpectedly detected in New Zealand milk. DCD residues have been only found in some milk powder products and not in other dairy products such as butter and cheese," McNee said in a statement. "The detection of these small DCD residues poses no food safety risk. DCD itself is not poisonous. It is actually vastly less toxic than common salt," McNee said. The statement also said that DCD is not related to melamine. In 2008, melamine-tainted milk killed six children in China and left 300,000 ill.
McNee said DCD is not used directly in or on food in New Zealand. It is a product used on pastures to reduce greenhouse gas emissions and the leaching of nitrogen into waterways. DCD is used by less than 5 percent of New Zealand's dairy farmers who applied it only twice a year. Each application leaves only traces of residue on the grass for no more than a few days. This means only very small numbers of New Zealand cows could have come into contact with DCD in very limited time frames, according to the statement. There has been no restriction on dairy sales in New Zealand because of this suspension of DCD use on pasture, said McNee. In China, some experts said consumers should not panic as DCD has very slight toxicity and there are no international standards for an acceptable level. Others focused on its toxic properties. Although it has a low toxicity, large doses of DCD can kill mice, Dong Jinshi, executive vice-president of the International Food Packaging Association and an expert in food safety, told Chinese media. And despite reassurances statement from the New Zealand government, Chinese consumers expressed concerns over New Zealand dairy products. Many Chinese shoppers had placed their faith in New Zealand milk following health scandals in the domestic industry. "So what else can we mothers choose to feed our babies? Am I supposed to make some soya-bean milk myself?" asked one mother with the tag "CCY" on the Weibo.com microblog. "I'm shocked to hear this. China should inspect these products to ensure safety," said Wang Lan, a 28-year-old local mother. 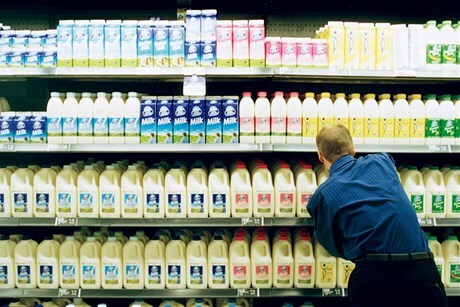 Some consumers said they would still opt for New Zealand dairy products. "Until test results show the milk is toxic, I'll still choose New Zealand products," said a web user on Weibo.com. The New Zealand govt insisted yesterday that the country's dairy products are safe, after traces of a toxic chemical were found in New Zealand milk. China's quality authority asks the New Zealand to provide detailed information on the incident.